The HingedTRUSS II™ is the strongest dry freight door built by WHITING Canada. Built to last, the double-wall extruded aluminum panels and truss design provide superior strength and puncture resistance resulting in the highest level of security and outstanding durability. 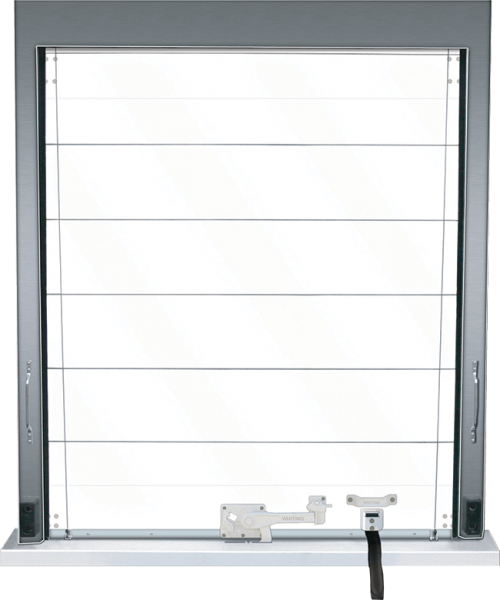 The sealed tongue-and-groove joints feature an anti-pinch design, making this roll-up door safe to operate. Panel joints are also double sealed to help minimize water ingression and extend the lifespan of the door. The continuous hinge design of the Hinged Truss II removes the need for center hinges and rivets which decrease maintenance and provides a smooth exterior that is ideal for adding graphics or decals. A primed finish is standard, or a range of automotive-quality paint finishes can also be provided. WHITING's HingedTRUSS II aluminum roll-up door is 100% recyclable and the perfect alternative to wood- or plate-based door products. The HingedTRUSS II™ comes with upgraded brush top and side seals, as well as HD5600 heavy duty bottom roller brackets. The HingedTRUSS II™ from WHITING Canada is a high end door solution designed to reduce maintenance and downtime. The HingedTRUSS II™ is compatible with the CommandLIFT® power door-lift system. Experience earned over six decades of innovation now sets the standard for overhead roll-up doors in the truck and trailer industry.